Announcing the final details for the Valletta New Year's Eve celebrations. 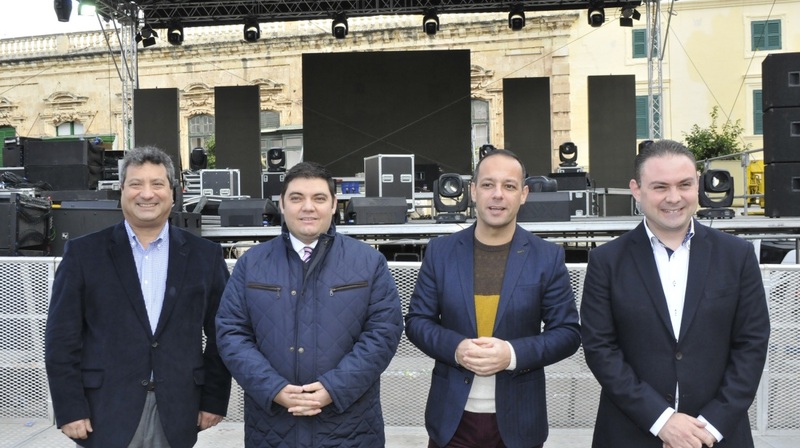 From left to right: MTA Chairman Gavin Gulia, Valletta Mayor Alexiei Dingli, Valletta 2018 Chairman Jason Micallef and Minister for Justice, Culture and Local Government Owen Bonnici. The highly anticipated Valletta New Year’s Eve Celebrations will kick off at 8pm this Thursday in Pjazza San Ġorġ for one of the biggest parties on the island. The festivities are being organised by the Valletta 2018 Foundation in collaboration with the Ministry for Justice, Culture and Local Government, the Ministry for Tourism, the Malta Tourism Authority and the Valletta Local Council. Local acoustic band Musique will be warming up the crowd with some jazz music followed by The Crowns, another local act. Deejays Pierre Cordina and Clint Bajada will also be entertaining the masses as will an orchestra featuring members from the Malta Philharmonic Orchestra led by Sigmund Mifsud. Special musical guests Glen Vella and Kevin Borg will also be performing on the night. The evening’s festivities will peak with the 3D Architectural Mapping Projections developed by Valletta 2018 and the MCAST Institute for the Creative Arts, which will be featuring a special countdown to usher in the New Year. The projections pay tribute to Valletta’s 450th anniversary by depicting important scenes and characters from Valletta’s history. Following the countdown, Gianni and Pawlu Borg Bonaci will continue to entertain audiences, ending the night with some of their best comedy.